Is tool specific of Humans? I choose photography to question mankind and Human behaviour. 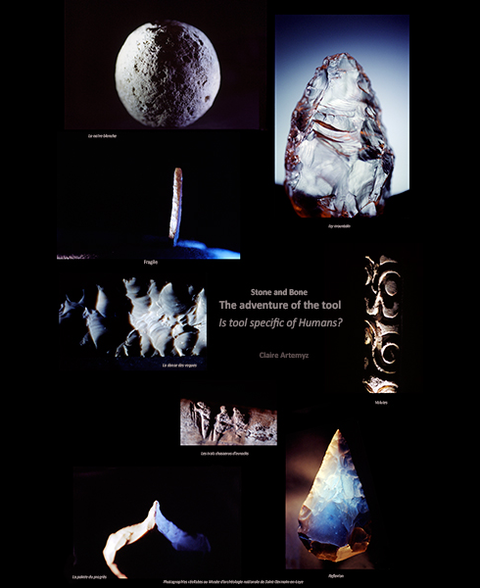 This led me to explore the prehistoric artefacts from museum collections. I am interested in what makes the difference between human and animal. It appears to be a fragile and moving frontier, constantly moving with the progress of new discoveries. and displaying the evolution from Mousterian to Mesolithic cultures. Some objects are mysterious and their purpose is unknown. My aim is not to show the objects in a scientific or descriptive manner. The use of light reveals unexpected aspects as a tribute to the patient and skilful work of the researcher. I try to put in images the emotion we feel in front of these early manifestations of Human thought.